With the Festival of Lights commencing on the evening of December 8, we thought we’d take a quick peek at the holiday shopping plans of this small but powerful group of spenders. On average, Hanukkah celebrants anticipated allotting $945 to gifts, décor, cards, food and flowers this year, 26% higher than holiday shoppers in general. Two-thirds of Hanukkah shoppers are also expected to take advantage of the seasonal deals and promotions to “self-gift.” And while gift cards, books/CDs/DVDs, and apparel top their wish lists, they are 35% more like than average to request jewelry this year. For more insights on the holiday season, visit the NRF’s Holiday Headquarters. While several major retailers, including Walmart, Kmart, and Toys R Us, have lowered or eliminated their layaway fees in efforts to spur holiday shopping, new insights from the BIGinsight™ November survey of more than 9,000 consumers reveal that this tactic doesn’t seem to be leading to a rise in this place-it-on-hold-and-pay-over-time purchase behavior. Just over one in ten holiday shoppers (12.3%) indicates they are using or planning to use layaway when shopping for gifts this season, relatively unchanged from one year ago (12.7%). With a flatlining number of consumers boarding the layaway train for 2012, it appears that this Great Depression-era policy is more bygone gimmick rather than a modern day marvel. However, further analysis of layaway users uncovers a specific type of holiday shopper. So without further ado, let’s take a look at ten characteristics that help identify this special group of consumers. 3. Layaway shoppers have a holly jolly outlook for the economy… Consumers reported that they were feeling better about the economy in November, but the sentiment among layaway users is downright giddy: 54.7% say they are very confident/confident in chances for a strong economy, much higher than typical holiday shoppers (40.4%). The issue of employment, though, is another story. About a third (32.7%) of layaway shoppers fears an increasing in the number of layoffs over the next six months, higher than holiday shoppers in general (22.0%). Layaway-ers are also slightly more concerned about becoming laid off themselves. 9. While they embrace their inner fashionistas, it’s electronics and toys that are bound for the layaway bins. While layaway shoppers are more likely to lean to familiar fashion labels and the newest trends/styles versus holiday shoppers in general, apparel is less likely to be put on hold compared to electronics and toys. 10. Discounters are most likely to get those layaway dollars. When it comes to the retailers shoppers are utilizing for layaway services, discounters score a definitive win here. Nearly two-thirds (65.5%) of holiday shoppers planning to use layaway this season will head to Walmart, while 42.2% say they will sign up with Kmart. Fewer will make use of the programs at Toys R Us (21.2%), Sears (15.2%), Burlington Coat Factory (12.4%), Marshall’s (12.1%), or TJ Maxx (9.9%). * Source: National Retail Federation/BIGinsight™. For more insights on the holiday season, visit the NRF’s Holiday Headquarters. New October Insights in a Snap! This month’s Consumer Snapshot is ready! The video below is a concise look at a few trending topics for the month of October, designed to give you a BIG picture view of current consumers. And NEW this month is the Consumer Snapshot InsightCenter™. When you register for complimentary access to this new InsightCenter™, you’ll have the ability to segment an advance preview of our all-star insights on consumer confidence, employment, shopping strategies, and future purchase plans by several key demographic groups. You can also download this month’s text summary (which includes additional insights) as well as the PowerPoint analysis through this InsightCenter™. Confidence is UP, but Feelings are Volatile. In the BIGinsight September monthly survey of more than 9,000 consumers, 38% indicated that they were very confident or confident in chances for a strong economy. This was a high reading for 2012 and a vast improvement over the September 2011’s 23%, when consumers were still reeling from the debt crisis. Confidence is riding a four-point upswing from August to September, but don’t look for this indicator to continue to improve at this pace – 2012 has been a rollercoaster ride for sentiment and continued fluctuation is expected headed into Q4. The outcome of the “fiscal cliff” drama on Capitol Hill remains big question mark for the sustainability of confidence – as well as holiday sales. Should we fall off that precipice – and realize an average 2013 tax bill increase of $3500 – holiday budgets are bound to shrink. Adding to the precarious position of the economy? Our continuously weak job market. And the upcoming Presidential election also adds to the uncertainty. Frugality is a Fixture in Consumer Finances. Along with the relatively robust increase in consumer confidence in September, we also witnessed similar increases in those focused on practical purchasing and buying just the necessities. In fact, both indicators are in line with what we saw a year ago, when confidence was just 23%. So yes, Virginia, despite the more positive outlook for the economy, consumers are still being very cautious with what they spend – even as we look forward to the holiday shopping season. Expect holiday shoppers to stick to budgets, avoid impulse buys, continue smart shopping strategies, such as couponing, sales/promotions, and comparison shopping, as gift-buying commences. Frugality continues to be the name of the game with consumers because they know the economy isn’t “fixed.” Paying down debt and reducing spending remain fiscal priorities headed into the final three months of 2012, while plans to increase savings reached a six-year September high last month, so it appears that consumers may be preparing for holiday shopping as well as those everyday unknowns. However, if it can be avoided, shoppers won’t make this Christmas on credit. Year over year, fewer are paying off just the minimum monthly balance on their cards, while we’ve seen a slight rise in those carrying $0 average monthly balances. The past four years have been a tough road for consumers, but they do appear to be focusing on not falling back into the lax spending/savings patterns that got them into a mess back in 2008. Consumers Know They Have the Upper Hand with Retailers. Can we call this retail transparency? The rising popularity of mobile devices has taken much of the mystery out of shopping for customers holding a smartphone or tablet. They can compare prices, check availability, and even click “buy” from virtually wherever they are located, and shoppers will work all angles – online, instore, mobile, social media, coupon sites, direct mail, email, and ad circulars – to make sure that their holiday spending remains on budget. It’ll be a spending game that consumers want to win. However, we know that all retailers can’t compete on low price alone [I’m looking at you, Best Buy.] Great customer service and personal rapport with shoppers will be key in driving traffic to retailers who aren’t low-price providers. Product selection, availability, and brand assortment – something department stores having really honed in on in the past few years – will also serve to turn shoppers’ heads this season. “Cheap is chic” is SO 2008; today’s shoppers want value and are willing to pay a little more for quality – as long as they can use a coupon. 2012 hasn’t been kind to JC Penney. And, it doesn’t appear that Q4 will get any better for the department store, which has struggled to shake up its stodgy image this year and in the process has rattled its core customer base. According to the Prosper Spending Index, JC Penney shoppers’ outlook for holiday gift spending falls below that of the general population, with an index of 95.9 (baseline index = 100). * Among JC Penney shoppers with holiday spending plans in mind, two in five (44.2%) plan to spend less on holiday gifts this year than they did for 2011, while fewer than one in ten (7.4%) plan to spend more. As could be expected, the holiday spending outlook is similar among those shopping Walmart (index = 94.4). Still, a slightly larger proportion of shoppers at the discounter, known to cater to more cash-strapped, lower income households, plans to spend more for the upcoming holiday season (9.5%) compared to JC Penney shoppers (7.4%). Among the customers analyzed, shoppers at Macy’s, a retailer which has arguably benefited from JC Penney’s EDLP strategy switch-up, maintain the most positive outlook on holiday gift spending, with a Prosper Spending Index of 110.9. TJ Maxx loyalists also hold a brighter-than-average outlook (index = 106.3). Target (102.4) and Kohl’s (101.0) shoppers’ holiday spending plans are in line with the overall average. So we know JC Penney shoppers will be trying to cut back on their holiday gift spending this year, but just how do they intend to accomplish this? Memo to Ron Johnson: Your shoppers (or what’s left of them) are still motivated to buy based on sales and coupons. Among JC Penney customers, nearly half say they are shopping for sales more often (45.4%) and/or are clipping coupons (42.1%) in efforts to help balance their budgets – higher than the overall average. Among the retailers mentioned, Kohl’s shoppers – rabid for that Kohl’s Cash – are the only ones eclipsing both of these figures. With economic uncertainty pervading consumer mindsets, today’s shoppers – JC Penney’s included – continue to possess an innate need to feel good about spending their hard earned dollars, particularly when it comes to spending on those not-so-essentials like gifts and apparel. And in shoppers’ “feel-good” toolkit are coupons, weekly promos, and special sales. These items are, of course, generally absent from JC Penney’s promotional strategy – setting the department store up for additional customer loss during the critical holiday season. Think about it like this: getting a $60 sweater on sale for $30 is something to write home tweet about. Simply buying a sweater for the $30 ticket price? It’s a little ho-ho-hum. 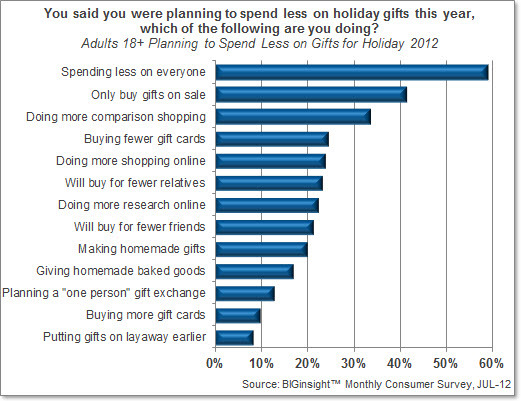 * Holiday outlook insights are based on celebrants who have holiday spending plans in mind.